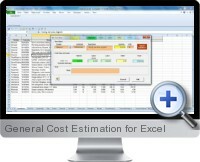 General Construction Cost Estimation for Excel creates accurate cost estimates in less time. The best way to create office productivity is now the easiest way to build accurate construction cost estimates. You can now work in a single Excel environment to quickly create, build, and manage cost estimates. As a contractor, improving estimating efficiency translates to increasing profits. Industry-standard CSI format cost data. General Cost Estimation for Excel is so simple that with a step-by-step wizard-like interface, you will generate a complete cost estimate within minutes.